Serve this incredibly tender pot roast with creamy polenta or thickly sliced roasted or grilled potatoes seasoned with olive oil, salt, and pepper. In a small bowl, combine the thyme, rosemary, paprika, dry mustard, and 2 tsp. each salt and pepper. Sprinkle the spice blend all over the roast. Cover and refrigerate for at least 2 hours but preferably overnight. Prepare a gas grill for direct grilling over medium heat. 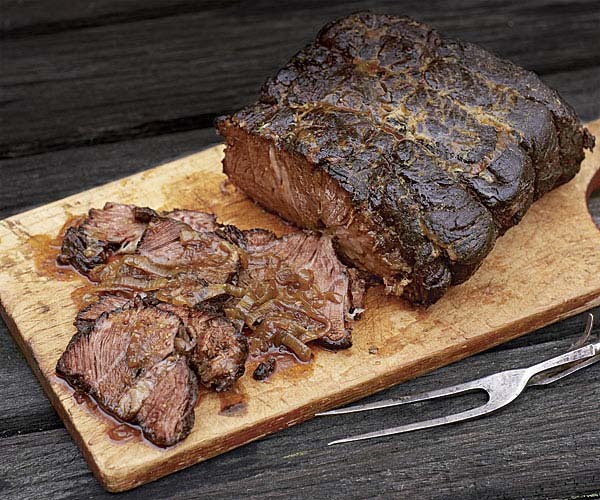 Grill the roast until nicely browned on all sides, 4 to 6 minutes per side. Let cool briefly and then tie the roast with several loops of butcher’s twine. Put the roast in an 8-quart heavy-duty pot. Prepare the grill for indirect grilling. In a small bowl, whisk 1/2 cup of the chicken broth with the bourbon, mustard, and molasses and pour the mixture over the meat. Scatter the onions and garlic on top of the meat; it’s fine if some fall off. Put the pot on the grill over the cool zone. Cover the pot, close the grill lid, and cook for 1 hour. Uncover the pot and turn the roast over so the onions are now on the bottom. Check the liquid level in the pot and add broth as necessary until there’s about an inch of liquid in the pot. Continue to cook, pot uncovered, grill lid closed, for 1 hour, stirring the onions and checking the liquid level every 20 minutes and adding broth as needed to maintain about an inch of liquid. Replace the lid on the pot and continue to cook the meat until fork-tender, about 1 hour more, checking after 30 minutes and adding more broth as needed to maintain 1 inch of liquid. Move the meat to a tray and pat dry. Pour the onions and juices into a heatproof vessel, such as a Pyrex measuring cup, and let sit until the fat rises to the top. Skim off and discard the fat. Keep warm. Prepare the grill for direct grilling over medium heat. In a food processor, purée 1/4 cup of the onion mixture with the mustard and rosemary. Brush about half of the glaze on one side of the meat and put the meat on the grill, glaze side down. Brush the top of the roast with the remaining glaze. When the glaze turns brown on the bottom, after 2 to 3 minutes, flip and brown the other side, an additional 2 to 3 minutes. To serve, remove the string and slice the meat into 1/2-inch-thick slices. Ladle the onion mixture over the meat and serve. 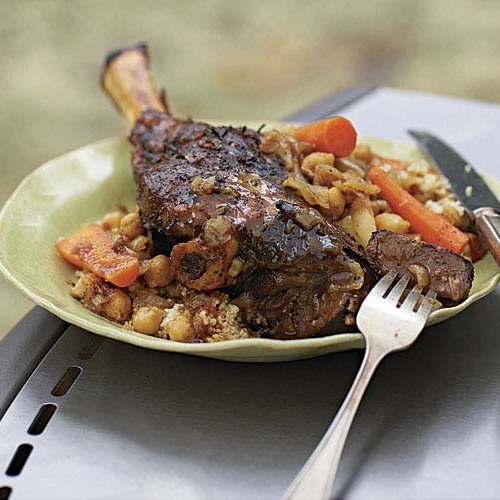 You can make this dish through the braising step the day before serving. Just cool and wrap the meat and braising liquid separately. Refrigerate overnight and glaze the next day. To spread out the work even more, you can season the meat the day before you braise. To use a charcoal grill: To sear the beef, build a medium fire: Ignite about 5 quarts of charcoal (80 to 100 briquettes), using either a chimney starter or an electric starter. When the charcoal is burning well, spread it out over the surface of the charcoal grate and put the cooking grate in place. Let the charcoal burn down until it’s coated with gray ash. To test the temperature, hold your hand about two inches above the cooking grate; when you can hold your hand there for 3 to 4 seconds (a medium-heat fire), you’re ready to sear the beef. After searing, divide the coals evenly, banking them against two sides of the grill (use long-handled tongs to move the coals). Put the cooking grate in place; if your cooking grate has hinged sections, position them over the charcoal. Place an oven thermometer on the grate over the cooler area, close the lid, and let the coals burn until the thermometer reads about 350ºF. When ready, place the pot over the cool zone and braise as directed above. Check the thermometer every 20 minutes, replenishing the charcoal as necessary to keep the temperature between 325ºF and 375ºF. If the coals are still burning well, you can simply add a handful of unlit coals on top. Otherwise, you’ll need to add lit coals. To glaze the beef, build a second medium-heat fire just as you did in the searing step. Continue with the glazing, as directed in the recipe. Lots of steps and lots of time for mediocre results. The outside of the beef was kind of hard and therefore difficult to slice. It was very tender and moist. I think pureeing the onion/braising liquid would make a nice sauce-like-gravy. I didn't have time to marinate the meat and we took it off the grill before the 3 hours were up. We only flashed grilled it with the glaze on as I didn't want to get the outside any harder. It was okay but not a WOW like most of the reviews. Amazing recipe. I served this for a dinner party and everyone loved it. The only problem was my DH started slicing the meat before I could get the mustard glaze on!! Not a problem - can't wait to do this one again! © 2019 The Taunton Press, Inc. All rights reserved. Fine Cooking may receive a percentage of sales for items purchased through links on this site, including Amazon Associates and other affiliate advertising programs. Do you really want to delete the list, ? This won't delete the recipes and articles you've saved, just the list. You must be a registered user to access this feature. Please log in or create a free account. This feature has been temporarily disabled during the beta site preview. This note is only visible to you. Are you sure you want to delete your notes for this recipe? You must be a magazine subscriber to access this feature.